David Cameron has pledged to fight for Turkey to be admitted to the European Union. This, he avers, would place them at “the top table of European politics”, where, he says, they deserve to be. But there are a couple of problems with this. Or possibly three. Or even four. 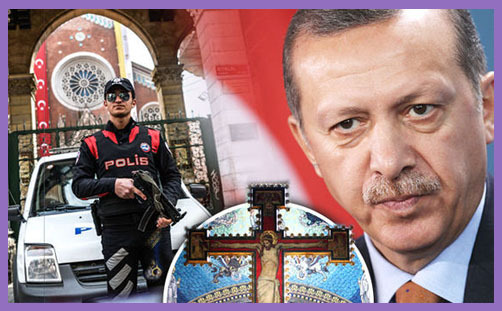 Firstly, President Recep Tayyip Erdoğan is currently busy seizing churches and land belonging to Armenian, Syriac, Chaldean and Protestant Christian communities. The ruling Justice and Development Party is zealously meting out ‘justice’ to Christians and pursuing ethnic and religious ‘development’ along traditional lines. “The government didn’t take over these pieces of property in order to protect them. They did so to acquire them,” Pastor Ahmet Guvener of Diyarbakir Protestant Church told the World Watch Monitor. The ‘nationalised’ churches now under Turkish state control are listed as: the Virgin Mary Syriac Orthodox Church, the Surp (Armenian for ‘Saint’) Sarkis Chaldean Catholic Church, the Diyarbakir Protestant Church, the Apostolic Armenian Surp Giragos Church, an Armenian Catholic church, and the Mar Petyun Chaldean Catholic Church. Turkey regularly features in the Open Doors ‘World Watch Map‘ of Christian persecution, and is currently ranked No.45 in the world (but still in receipt of £9million of UK aid). While executing this progrom, President Erdoğan cloaks himself in immunity from all criticism. Insulting the president is a crime in Turkey punishable by up to four years in jail, but the consequences of being even a bit rude about him appear to extend to the EU. Chancellor Merkel has acceded to a request from Erdoğan to prosecute German comedian Jan Böhmermann for reciting a ‘poem’ (scarcely) entitled ‘Slanderous Criticism‘. And now Dutch journalist Ebru Umar has been prevented from leaving the country after tweeting something critical of the Turkish President. Imagine Turkey within the EU, when this blog post might fall within the purview of the European Arrest Warrant, and application is made to seek out His Grace’s ashes and extradite them to rot in Sağmalcılar Prison (or perhaps not there: it’s now a posh hotel) along with the ghost of Billy Hayes and any journalists, artists or intellectual dissidents who fall out of favour with the King of the Turks. By way of challenge, the Spectator has launched ‘The President Erdogan Offensive Poetry Competition’ (£1000 prize to be won). Send your entries HERE. There’s also the slight problem of the Armenian Genocide, in which Turks tortured and slaughtered well over a million ethnic Christians as the curtain was falling on the Ottoman Empire at the beginning of the 20th century. Or perhaps David Cameron agrees with President Erdoğan (and Pope Francis?) that this wasn’t ‘genocide’. The Prime Minister does appear to be a little confused as to what precisely constitutes ‘genocide’: if the contemporary systematic eradication of Christians and Yazidis from Iraq doesn’t qualify, a million or so pesky Armenians from a few skewed history books won’t matter either. As Turkey’s denial deepens, Europe’s silent embrace is extended, eyes averted. One person’s ‘genocide’ is another’s ‘necessary measure’. The killing fields and starving deserts of a century ago are of little consequence: ‘Europe’ must be united in peace and reconciliation. What is truth? Then there’s the small matter of whether Christians should vote for Turkey. Or, indeed, whether they would do so, for the French Constitution (Article 88-5) demands a referendum to ratify Turkish accession to the EU, and democracy can be a very inconvenient thing (as the EU has found previously in France, Denmark, the Netherlands, Ireland and Greece; and as Austria is just discovering). Turkey is in a state of denial about its own bloody history: it denies freedom of religion, prohibits freedom of speech, and rides roughshod over the freedom of the press and other media. Turkey cannot be reconciled to European civilisation until she is reconciled to Armenian suffering. Quite why David Cameron thinks they deserve to be “at the top table of European politics” is something of a mystery. Unless it is born of political ignorance, religious disregard and a crass, superficial grasp of the inevitable consequences for Europe and the UK – within Schengen or without.